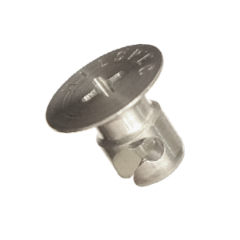 When using Z-Spec fasteners you will need at least 2 parts to make up the system. A stud, and "S" Spring Receptacle. 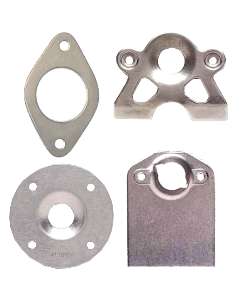 Optional Grommets, Retainers, Weld Tabs and ancillaries may be required depending on how you want the assembly to perform. When designing a new application it is best to select components from the inside out. First, determine which series (diameter) and Spring Receptacle you want to use. Next, select the Grommet or Retainer you wish to use (if required). Finally, select a Stud Style and Material. Once you have selected the components to be used, be sure to get the appropriate associated tooling. The required tools will be determined by the parts you select. Reference Information: We have included some tables and drawings at the bottom of this page to assist in the parts selection process. If you have any questions or need additional information, please Contact Us and we will be glad to help. 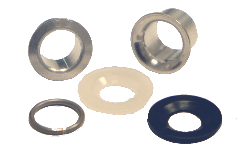 These Oval (round) Head Studs are Retained in the Panel When Unlocked by Using A Grommet or Snap Ring. Mainly Used in Aviation. These Oval (round) Head Studs are Not Retained in the Panel When Unlocked. They can be Completely Removed. Mainly Used in Racing. 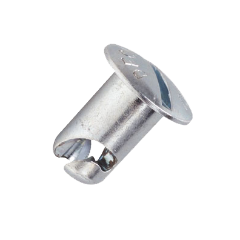 These Ejector Head Flush (EHF) Studs are Mounted With Rivets and Stay With the Outer Panel. The Heads Pop Up When Unlocked Giving a Visual Sign to the Operator. Mainly Used in Racing. 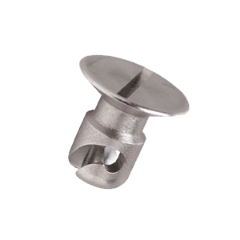 These Flush (countersunk) Head Studs are Retained in the Panel When Unlocked by Using A Grommet or Snap Ring. Mainly Used in Vintage Aircraft and Warbirds. 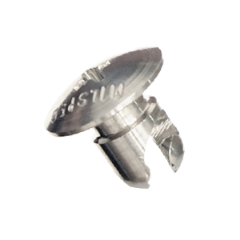 These Flush (countersunk) Head Studs are Retained in the Panel When Unlocked by Using A Grommet or Snap Ring. Mainly Used in Aviation. These Flush (countersunk) Head Studs are Not Retained in the Panel When Unlocked. They can be Completely Removed. Mainly Used in Racing. 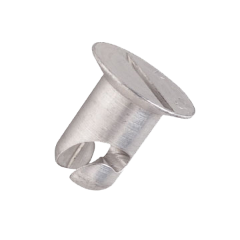 Retainable Studs Use These Secondary Components to Keep the Studs in the Panel When Unlocked. Grommets Also Protect the Panel Hole From Enlargement Due to Vibration. 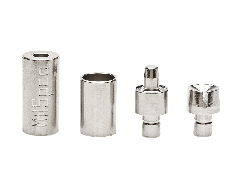 MilSpec's Grommet Flaring Attachment Sets are a Lot Easier to Use Than the Original Style Tools From the 1930's. Our Spring Adjusting Tool, Fastener Drivers and Dimple Die Sets Will Also Make the Process Much Easier When Fitting and Preparing Panels! 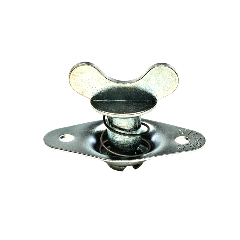 "S" Spring Receptacles are what Z-Spec Studs Lock Onto and They are Attached by Rivets or Screws to the Back Side of the Support Structure That the Panel is Being Fastened to. 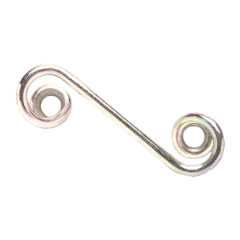 Weld Tabs are Used to Mount an "S" spring Receptacle When an Inside Panel is not Available. They are Generally Attached to the Interior Structure or Frame Perimeter. 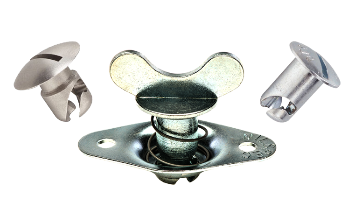 We Also Carry Doubler Plates and Other Items to Enhance Fastener Installation. How to measure for Z-Spec (Dzus®) Fasteners and Other Helpful Hints. All dimensions are in inches unless otherwise specified. For metric conversion use this formula: Inches x 25.4 = mm. mm ÷ 25.4 = Inches. In figure 1 above, A is the outside panel. B is the wall thickness of the flare grommet or thickness of the retainer if one is used. It could also be a gasket (compressed) or gap if any exists between panels in the application. C is the inside panel or support structure to which the receptacle (spring) is mounted. Add all of these dimensions together to come up with your TMT (total material thickness) which will be used to calculate the proper stud length and spring height for the application. 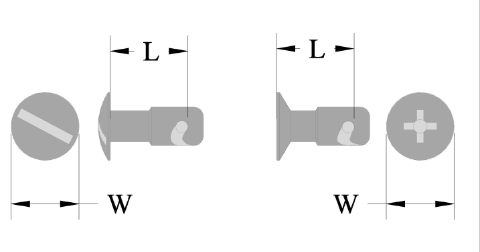 Figure 2 above shows how to measure the grip length (L) of an existing stud. This grip length is denoted as the dash number portion of the full part number. For example, part number MSAJ5-50 measures .50" in grip length. Z-Spec fasteners typically vary in length by .050" increments from size to size (.50", .55", .60" etc.). For oval head studs measure from under the head to the bottom of the detent where the spring sits when locked. For flush head studs measure from the top of the head to the same point. W is the head diameter which will indentify the stud's series. 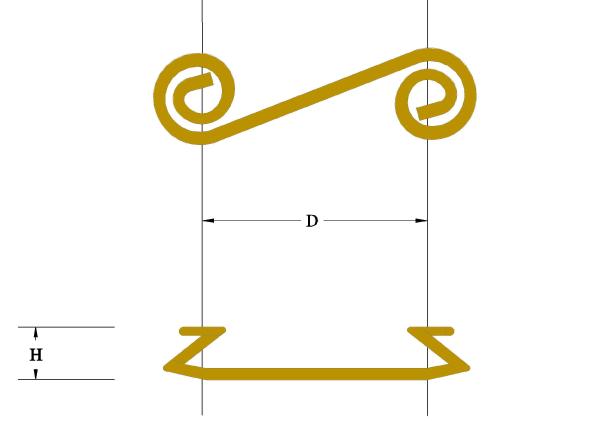 Figure 3 above shows the rivet spacing (D) and the height (H) of a typical Z-Spec spring receptacle. All springs in a given series have the same rivet spacing. For example series 5 springs all have 1" spacing from center to center of the attachment (rivet) holes. Within each series there are different heights which, when used with different stud grip lengths, allows the installer to calculate the proper panel fit. The spring part numbers denote the the series first and then the height as a dash number. For example part number MS6-375 is a #6 series with a height (H dimension) of .375". The table below shows the rivet spacing for each series. 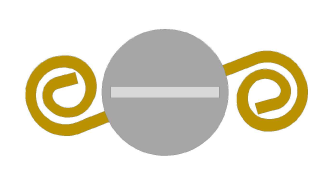 Figure 4 above depicts the correlation of alignment between the stud's slot (or wing) and the 'S' spring receptacle attachment. As you can see, the stud's slot will always align with the rivet holes of the spring. Therefore, regardless fo the mounting angle of the spring, the stud slot will always align with it. This is helpful for planning how the installation will look and also gives a visual sign of an unlocked fastener.